DETROIT -- Ford Motor Co. today recalled approximately 650,000 vehicles in North America, including 35,614 in Canada, with faulty seat belt anchor pretensioners associated with at least two accidents and two injuries. The automaker said the affected part in 2013-16 Ford Fusions and 2013-15 Lincoln MKZs could separate during a crash because of increased temperature during deployment, and may not properly restrain a driver or passenger. 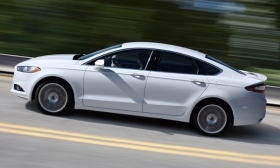 2015-16 Fusions built Aug. 1, 2014-Feb. 22, 2016, in Flat Rock, Mich.
Ford says 602,739 affected vehicles are in the United States., 35,614 are in Canada, 8,665 are in Mexico and 653 are in federalized territories. Globally, 680,872 vehicles are affected. Dealers will inject a coating into the pretensioners to protect the cables from increased temperatures for free. Separately, Ford today recalled 27 unites of the 2017 Fusion to replace the second-row left-rear seat back frame. Ford said it is unaware of any accidents or injuries related to the recall. The affected Fusions were built Sept. 27-28 this year in Hermosillo, Mexico. Of the 27 vehicles, 25 are in the United States and two are in Canada.